The content of this article provides interesting history, facts and information about Roman Soldiers Clothing. 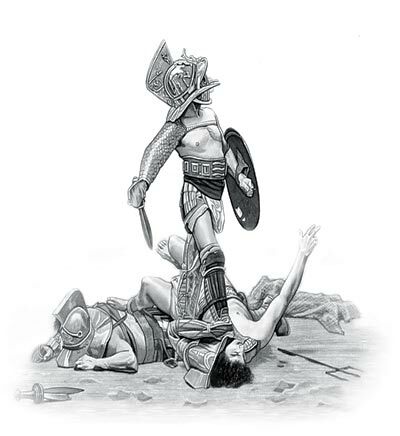 Read on to learn about the clothing of the ordinary legionary soldier (miles legionarius). All of the Roman Soldiers clothing was military standard, so everyone would look uniform. A Roman Soldiers clothing changed depending on the era and provinces where the troops were fighting and stationed. The materials used to make their clothing was practical - lighter cloth such as linen for hot climates and heavier cloth such as wool for colder climates. The styles of a Roman Soldiers clothing also changed to suit colder climates. An example of this are trousers, or Braccae, a style of pants, made from wool. Taking these changes into account this page provides a 'generic' overview of the most common items of a Roman Soldiers Clothing. Items suitable for cold weather and those suited for hot weather are detailed on this page. The basic clothing including the tunic or cloaks of the Roman soldier was either red (dyed with madder) or undyed material giving an off-white color. Description: The loincloth was a basic item of clothing described as a one-piece male garment made of wool or linen. Description: The socks (udones) were quite common apparel (made sense with the marching requirements of Roman Soldiers). Full coverings or socks without a toe or heel were also worn. Description: Leg wrappings or leg bindings (puttees) were strips of material wrapped from the ankle up to the calf of the leg. Description: Braccae is the Latin term for trousers, a style of pants, made from wool, which became popular with soldiers in the colder climates of the Empire. Braccae were fastened with a drawstring and were of varying lengths from just above the knee or to the ankles. Description: The Military Tunic (Tunica) was a wide, shirt-like, undergarment made made of a long piece of rectangular cloth, made of wool, cotton or linen depending on the climate. It was originally sleeveless and usually white. The tunic later acquired sleeves. The tunic was girded with great care to the exact length considered correct for the rank of the wearer. Description: The Military belt (cingulum militare) was wore around the waist of the soldier and acted as a holder for his dagger and the apron that hung from the front portion of the belt. Description: Pteruges, (aka pteryges) from Greek word meaning feathers, refers to the decorative strips of leather (lappets)which hung below the waist and from the shoulders of Roman legionaries. Pteruges hung from the belt to the lower waist. The skirt or apron was made up of leather strips and heavily studded with metal. Offering little protection, the apron would have been used as a display and as a source of noise. The Roman Soldiers also used the apron / skirt as decoration by attaching tokens and discs to signify the campaigns he had fought in. Description: The sagum was the woollen cloak worn by the Roman soldiers and inferior officers, open in the front and usually fastened across the shoulders by a clasp. Another style of cloak was the paenula, a poncho style cape with a central hole for the head. Description: The Scarf (focale) was a useful addition to the clothing worn and could be wrapped around the neck to prevent chaffing woolen scarves could be wrapped around the body for extra warmth. Description: The Military sandals or boots (caligae) were strong with the addition of iron hobnails designed to withstand miles of marching. The content of this Roman Soldiers Clothing category on Roman clothes worn by the people of Ancient Rome provides free educational details, facts and information for reference and research for schools, colleges and homework. Refer to the Colosseum Sitemap for a comprehensive search on interesting different categories containing the history, facts and information about life and clothes worn in Ancient Rome.